Katharine Tulman is an orphan at the total mercy of her cruel aunt Alice. Katharine's only hope for any sort of future is to stay in the good graces of her aunt and continue to do the accounts for the household. She thought this would be easy enough...until Alice sends her to the family's estate to commit her Uncle Tulman to an insane asylum for squandering the family's fortune. Katharine finds the task unpleasant, and hopes to just get it over with quickly...but she is shocked at what she finds at Stranwyne. Her uncle is peculiar and childish, but a brilliant inventor. Furthermore, the estate is populated with people he has rescued from the workhouses on London. Katharine must decide between keeping in her aunt's good graces and ruining countless lives, or discovering a way to conceal what's going on at Stranwyne without raising suspicion...and risk her own future. 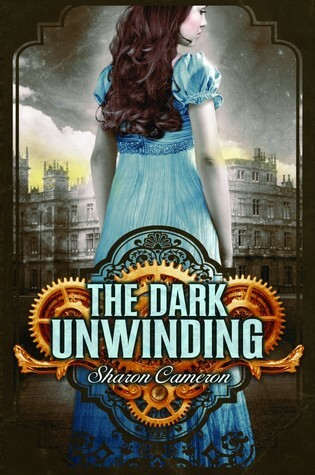 Sharon Cameron's The Dark Unwinding is an engaging, dark, and thoughtful steampunk tale. Katharine Tulman is a superb protagonist. She is well aware of the restrictions placed upon her by her aunt and society, but she doesn't let them define her. She is a clever girl and she has a plan for ensuring her survival, and her major struggle is deciding what to do when that plan is threatened by her conscience as she falls in love with Stranwyne Keep and the people there. The estate is a magnificent setting, full of hidden rooms, underground tunnels, and impossible inventions. The characters are equally mysterious and vivid; Uncle Tully's highly eccentric personality is what makes him such a genius, and the protective Lane Moreau and Mrs. Jeffries are fiercely loyal and will do anything to protect him. Aunt Alice is the perfect character to hate, and even the minor characters are intriguing. There are a lot of twists and darkness throughout the book to keep you guessing—is anyone truly mad at Stranwyne, and if so, is it Uncle Tully or someone less obvious? The last quarter of the book is full of action and secrets and suspense, building up to a good, if unexpected, ending that leaves room for more books about Katharine and all of the fascinating residents of Stranwyne. Cover Comments: I love the gears behind the title--very cool and very appropriate. I also love how the model is in a blue dress, which has some significance in the book. This is a beautiful and atmospheric cover! I was actually disappointed in the amount of steampunk in this book-I expected a lot more and I think my view of the book was lower than it otherwise would have been because of that. I did love the Gothic elements and wish I had appreciated them more.